A fracking site in Wyoming, USA. 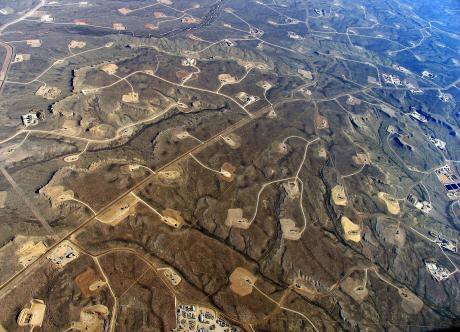 So far, the USA is the only country in which fracking is happening at scale. Photo credit: Bruce Gordon via EcoFlight / Simon Fraser University via Flikr. CC BY 2.0. What does it mean for our country when citizens are jailed for peaceful activism? Last week Preston Crown Court jailed three men for protesting against the activity of controversial fracking giant Cuadrilla. The three men - a piano restorer, teacher and soil scientist - were given hefty sentences of 15-16 months in prison for causing a ‘public nuisance’. Although the jury found them guilty, they were not given the whole picture. By law they were unable to even consider the mens' motivations because the offence for which they were being tried (the antiquated charge of ‘public nuisance’) is narrow and only allows for consideration of the disruption caused. When it came to sentencing, the court found their political convictions to be an aggravating factor: “each of them remains motivated by an unswerving confidence that they are right”. These were the first protesters to be imprisoned following a criminal trial since 1932. Protesters have been imprisoned for breaching court orders (for example, in 1993 seven people were sentenced to 28 days imprisonment for breaking an injunction which prevented them disrupting the construction of the M3 at Twyford Down). But these will normally result in prison as it is similar to a contempt of court. It is a significant difference to imposing imprisonment for the offence itself (whether it is aggravated trespass or public nuisance). The length of the sentences are also significant. The law is clear that custodial sentences should be reserved for the most serious of crimes, and, when they are deemed appropriate, should be as short as possible (see sections 152 and 153 of the Criminal Justice Act 2003). The sentences in this case are clearly excessive. By imposing such draconian sentences, which seem to have been influenced by the political motivations of the protesters, the court is sending out a strong and unsettling message. Business as usual will not be disrupted, especially by conscientious, concerned and peaceful citizens exercising their civil rights. Given the grave negative ecological impacts that human activity is having on our planet we should surely admire and applaud the few who have the courage to take action. Instead we are putting them behind bars. This verdict sets a worrying precedent for other protesters. Fifteen activists who secured themselves to a Home Office deportation flight to Nigeria, Ghana and Sierra Leone are currently on trial for terrorism offences. In labeling these peaceful activists as terrorists, the CPS is sending out an equally worrying message. Our fundamental rights of freedom of expression and assembly are under threat and the space for civil opposition is shrinking. If anything, this should serve as encouragement to take action.